Junk and Rubbish Removal Services in Ohio. At 1844-Junk-Rat – junk and rubbish removal in Ohio is made easy… because we do all of the work! 1844-Junk-Rat.com offers service in Ohio and beyond. Our company offers trash hauling, junk removal, garage clean outs and other waste removal services at an affordable price. We are the junk people and pride ourselves in offering the full platter when it comes to services. We handle all the heavy lifting, pick-up, loading, cleaning and disposal of all of your junk. Being an eco-friendly business, we also make sure to recycle as much of it a permissible to keep the environment clean. 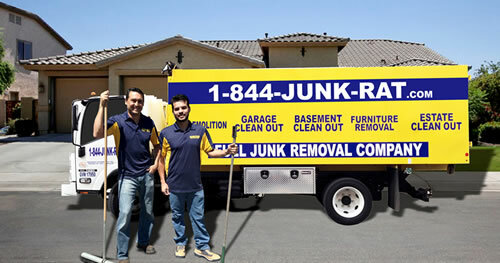 1844-Junk-Rat.com will come to your home or business and happily get rid of your junk so you don’t have to. Setting up an appointment is easy, just call our office, get a simple quote and set up a time for us to come by that fits your schedule. We arrive on time and start working right away, we even make sure to clean up after the truck is loaded to ensure your complete satisfaction. Our house was sold rather suddenly and we needed to get it emptied pretty quickly before we handed over the keys. There was a lot of junk, but also a lot of useable items that we simply didn’t want to take to our new house. We called 1844junkrat.com/ because our real estate agent told us they were quick, affordable and experts at REO donation and recycling. She never gave us bad advice so we called. After a quick phone conversation with the professional and kind scheduler, we had a time set up for the next day. When the trucks, yes three, came to the house we were delighted that they were on time as scheduled. The guys were professional and already knew the scope of the work so they jumped right down to it. Within a few hours the entire house was emptied, cleaned and ready for the new owners. We couldn’t believe how efficient 1844junkrat.com/ haulers were! If you are looking for a dependable company look no further.